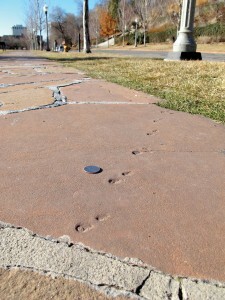 Immediately northeast of downtown Salt Lake City, the sandstone slab sidewalk in Memory Grove Park contains several ancient and unique trackways. This Brasilichnium trackway lies northwest (up canyon) of the pond, adjacent to the second tree past the fire hydrant (hydrant visible near the top, center-left of photo). U.S. quarter for scale. Disclaimer: The sidewalk has been rebuilt since this article was written and we are not sure if the tracks are still visible. Fascinating geology is all around us, even when standing in an urban park just a stone’s throw from downtown Salt Lake City. We recently received a call from someone curious about footprint impressions in the sidewalk at Memory Grove Park, which is in City Creek Canyon immediately northeast of downtown Salt Lake City. 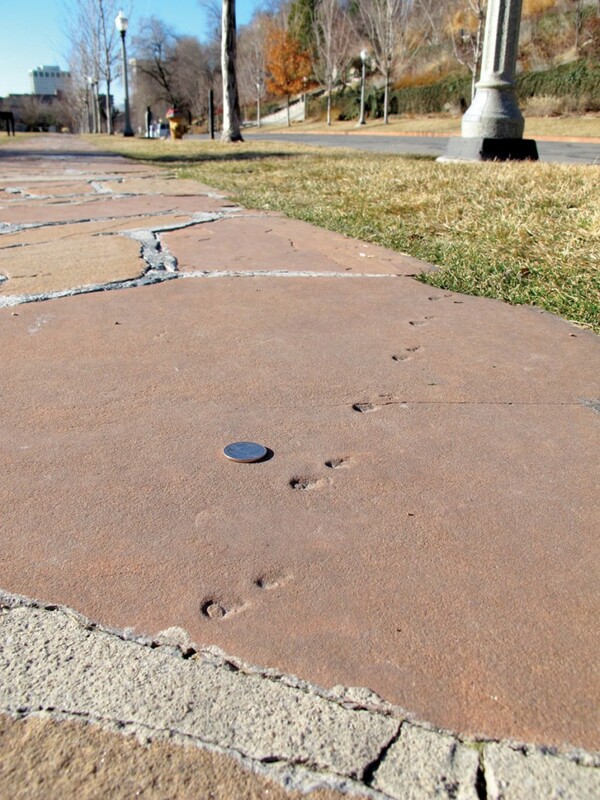 While there is a sidewalk leading to Memory Grove Park that includes artist representations of local wildlife tracks on inset granite plaques, the caller was referring to ancient tracks in the sandstone slab sidewalk within the park itself. The caller, Phoebe Bergvall, is a writer for Salt Lake City’s Examiner.com, and she found what she described in an online article (www.examiner.com/article/limping-squirrel-memory-grove-part-2) as “actual tracks made by a small animal millions of years ago.” She further speculated that the tracks could have been made by a squirrel-like creature with an injured leg. Phoebe’s observation that the small marks were tracks proved correct, and her speculation that the tracks were made by a limping squirrel-like creature was pretty close. 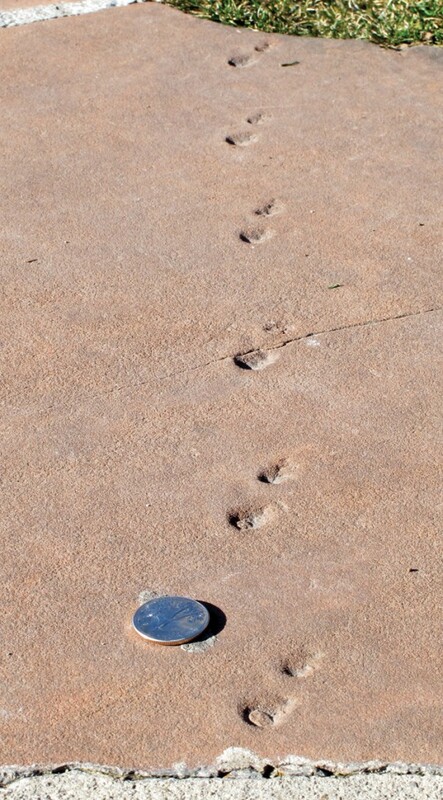 To learn more about the tracks, UGS geologists contacted track researcher and University of Utah student Tracy Thomson. Tracy visited Memory Grove Park and found four sandstone slabs with good trackways and a few blocks with other types of less distinct tracks. Tracy identified what Phoebe found as 180-million-year-old (Jurassic) Brasilichnium trackways, which are thought to be made by a burrowing mammal-like animal named Tritylodon. One of these newly discovered Brasilchnium trackways is significant because it appears to show a galloping or loping locomotion not previously described. Tracy also found scorpion-like trackways that appear to be very similar to Paleohelcura trackways found at Dinosaur National Monument. The sandstone sidewalk has been in Memory Grove Park longer than anyone working for Salt Lake City can remember, so the stone’s origin is uncertain. However, the flagstone slabs are believed to be Nugget Sandstone, probably quarried in Wasatch County just east of Heber City. The Nugget Sandstone was once part of a huge sand “sea” called the Navajo erg, which is thought to have covered Utah and parts of surrounding states. This vast expanse of sand was not completely dry. Within the dune fields were shallow lakes that created hospitable oases for Tritylodons, dinosaurs, reptiles, and other animals and plants. Quarried Nugget Sandstone has been used extensively along the Wasatch Front, so other urban trackways and similar wonders may be awaiting discovery. While fascinating, these trackways are not obvious. I have run over them many times without noticing. How did Phoebe recognize these small divots in the sidewalk as trackways? She may be predisposed to acute geologic observation; although she is not a geologist, both her parents were. Furthermore, Phoebe’s mother, Martha Smith, worked as a geologist for the UGS from 1977 to 1987 (see the September 2011 issue of Survey Notes). Martha Smith was the UGS’s first Information Specialist, a predecessor to the position I now have.